People Who Go All Out For Halloween: Why? It's spooky season my dudes. It's the most wonderful time of the year...FALL! Personally, autumn is my favorite season; it's not too cold out, but you're not drenched in sweat after spending ten minutes outside, the leaves are changing colors, you get to carve pumpkins, drink hot apple cider, and spend your weekends cozying up with your friends around a crackling bonfire. One of my favorite parts of fall is admittedly Halloween. I mean, what other time is it socially acceptable to buy bags of candy at a time and it doesn't make you seem like a pathetic loser? Yes, I'm talking about you, Valentines Day. However, just because I'm a fan of Halloween doesn't mean I understand why exactly there's so much excessive hype for Halloween. Yes, it's fun and all to dress up in costumes, but do you know how hard it is to pick one singular costume? I have less than a week to figure out my costume before all the Halloween parties start, and I still haven't even figured out a general idea of what I want to dress up as. Halloween is one freaking night in the year, and I've seen people spend ridiculous amounts of money and time planning what they'll wear for a few hours and then most likely get drunk and puke all over. Heck, I've seen people planning multiple costumes for the weekend because they don't want to wear the same outfit to parties on different days. As one broke college student to another: props to you for managing to afford that, but also why would you do that when you could spend that hard-earned money on something like Cane's instead, am I right? Literally, at Halloween stores, you'll see people spend hundreds on costumes and makeup to wear for three days, maximum. I'm not opposed to Halloween and parties, and honestly, I love getting free and/or discounted candy as much as the next person, but I still don't really care ~that much~ about dressing up at the end of the day. Also, can we please make going trick or treating a thing in college? I enjoy a good party every once in a while too, but I would so rather spend my weekend collecting free candy and having a good time with my friends than watching them drink until they almost black out and being surrounded by people who feel like they have to dress in revealing clothing to get others' approval. Also, if you live anywhere in the Midwest/Northern United States, it's definitely hovering around freezing point so why would you want to spend all night freezing? Halloween may have just passed but horror movies are more popular than ever. Thus you more than likely have seen quite a few pentagrams. The pentagram has become heavily associated with the devil and evil practices. However, the pentagram (or pentacle) actually has no relation to the devil at all. The pentagram is an incredibly common symbol in many different religions, including Christianity. The pentagram is a common pagan/Wicca symbol. However, the earliest use of the pentagram was actually not from pagans, but from ancient Sumeria. In 6th century BCE, the symbol was used to represent the human body. In the physical form (head, arms, and legs) seen below, and elemental form (earth, air, fire, soul, and water). The pentagram was also used in Judaism, representing the 5 books of the Torah. 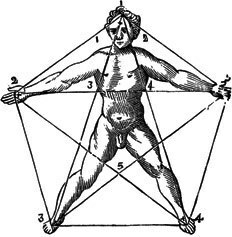 Even in early Christianity, the pentagram was used to represent Christ’s five wounds. Christians thought the pentagram was actually protective, and it was a more common symbol of Christianity than the cross in early times. It was worn on amulets and jewelry. The pentagram actually symbolized Christ himself. 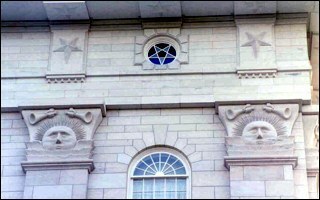 Some LDS churches still have pentagrams on the outside of them, and often receive a lot of backlash because of it. "Christian Kabbalists of the renaissance were especially enamored of the pentagram, which they viewed as a mystical proof of the divinity of Christ – to them, it symbolized Christ as the Holy Spirit manifest in the flesh." Simply put, the pentagram was used in a multitude of religions and beliefs. The symbol started getting bad connotation in the 14th and 15th century, mainly because of the rise of occult practices (study of astrology, magic, alchemy, etc.) that used Judeo-Christian symbolism and beliefs. They used many symbols from Paganism and Gnostic religions, including the pentagram. The Christian church would (surprise surprise) accuse the practices of heresy. So naturally, anything associated with the occult practices became associated with heresy. Even though the pentagram was once a very common Christian symbol, the witch hunt craze in the Victorian times caused the symbol to the associated with paganism, witchcraft, and Satan. In the 20th century, Hollywood adopts the pentagram as a symbol for evil and devil worship. The symbol creates quite a good shock value, so it’s put into almost every horror movie imaginable. 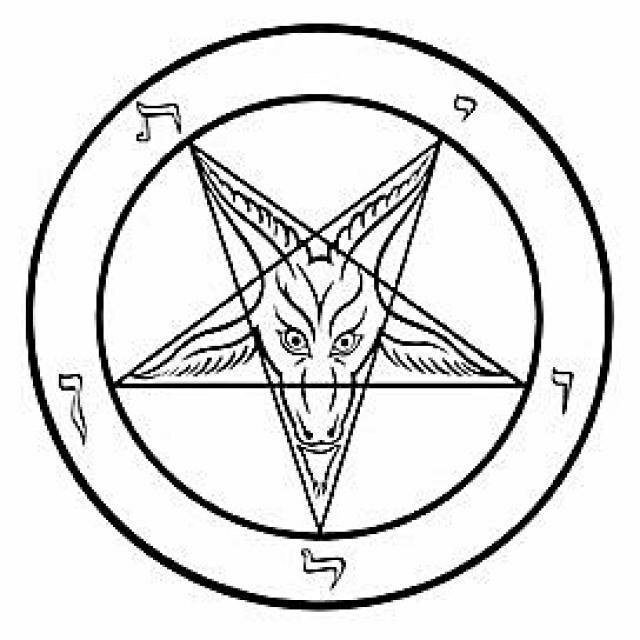 The pentagram has no historical ties to evil or “Satan-worshipping”, and was simply given a bad name due to Hollywood and the emergence of the “Church of Satan”, who used the upside down pentagram with a goat head to symbolize their church (seen below) The “Church of Satan”, however, does not worship the devil or any evil presence (or believe in doing evil), they’re just atheists.